My co-researchers and I are currently analyzing data that we have collected as part of the Nepal Peacebuilding Survey, a multipurpose survey in 96 hamlets across Nepal studying the impact of wartime violence with implications for peacebuilding policy. Some background is here (link). Our implementation partner is New Era Nepal (link). To inform our analysis, I’ve conducted a review of findings from qualitative (that is, ethnographic and journalistic) accounts of the effects of wartime violence in rural areas. I’m posting the review here (PDF) as a reference for others who might be interested. It is written in a very succinct style, and it presumes a good amount of previous knowledge about the 1996-2006 conflict between Maoist and state forces. Good background information is available on the web from, e.g., the International Crisis Group (link). Comments are very welcome, either here in the comments section or via email. I’m especially interested in recommendations of additional literature or comments explaining different interpretations of the findings in this literature. I’ll share more on the findings from the data analysis as we complete it. This entry was posted in Uncategorized on April 25, 2011 by Cyrus. With the Cote d’Ivoire election crisis having moved toward resolution, there is a lot of discussion about how to deal with the challenges posed by close, contested elections. For example, Knox Chitiyo provides a great analysis in a BBC report (link), emphasizing the need for creating “higher, independent judicial” bodies “to resolve post-electoral disputes”, and noting how international support for Ouattara in Cote d’Ivoire suggests a turn away from “the power-sharing default setting” that informed the approach to the recent election crises in Kenya (2008) and Zimbabwe (2008-9). Now is the time to think about a whole range of measures that can be used to minimize uncertainty about the validity of vote counts, and commit candidates to accepting validated results. I thought I’d look at some data to help put the recent Cote d’Ivoire crisis into context. Conveniently enough, Staffan Lindberg at the University of Florida has provided a freely available African elections dataset covering 1969-2007 (link). The graphics posted below display some trends, using only data since 1980 (the pre-1980 data is quite patchy). Figure 1 shows that close elections are increasingly the norm in Africa. The figure shows margins of victory for executive offices in both presidential and parliamentary elections since 1980. A trend line with error margins is overlaid (based on a loess fit). Whereas prior to 1990, landslides were the norm, since then close elections have become increasingly common. Interestingly, in very recent years, we see that there cease to be any “near 100%” margin-of-victory elections. This may reflect the effects of increased citizen awareness and activism, given that such outcomes are incompatible with free-and-fair elections process when there is any modicum of pluralism. Figure 2 shows the flip side of the same coin, displaying trends in executive incumbent losses and resulting turnover since 1980. Consistent with what Figure 1 shows in terms of margins of victory, elections have become more competitive, with the proportion of elections resulting in executive turnover having risen from almost zero to about 25% as of 2007. Figure 3 looks at how margins of victory and incumbent losses relate. In a free and fair system, there should be a systematic relationship between the two. Namely, a margin of victory of about 0 suggests a tie between the two front-runners. In such cases, assuming that the two front-runners have equal resources, it should be that each front runner has about a 50% chance of winning. In nearly all of the elections in these data, one of the front-runners is an incumbent or incumbent-party candidate. Thus, in close elections, we should see about a 50-50 split in whether or not there is an incumbent loss and consequent turnover of executive power. Figure 3 shows that overall since 1980, this has not quite been the case, as incumbents and incumbent parties have lost only 40% of the time. However, when we break this out over time, we see that the pattern is converging to the expected outcome in fair elections. In 1980-1990, margins of victory were never close to zero, and so this phenomenon was unobservable. 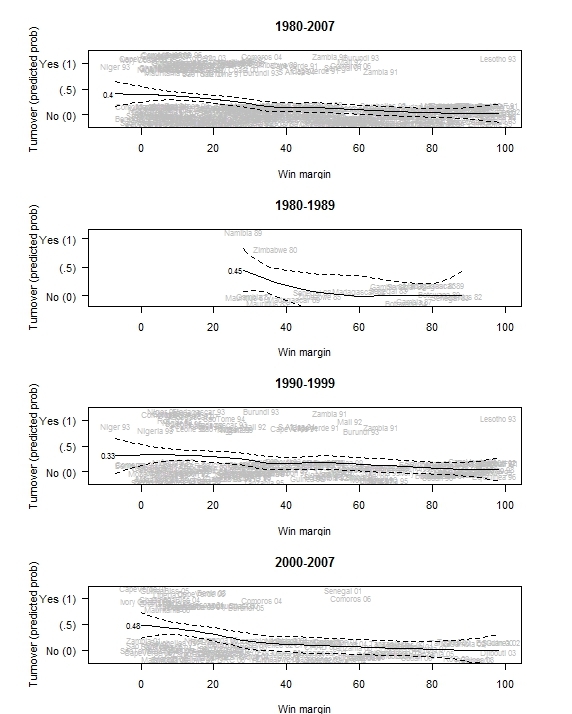 In 1990-2000, we see that there were many close elections, but that the outcomes were dominated by incumbents. Notice that with the exception of Niger 1993, those clumped very close to zero are almost entirely incumbent victories. This is suggestive of some electoral shenanigans. A possible story is that some portion of these elections were due to be incumbent losses, but that some form of fraud was perpetrated by incumbents (who, after all, are in a position of strength to do so) to ensure that the loss did not occur. This is just a conjecture, though. Note that such signs of incumbent advantage in close elections are not unique to Africa. For some US examples, see this past post (link). But as the third graph in Figure 3 shows, in the past decade, the pattern expected of fair elections is evident. The predicted probability of an incumbent loss when the margin of victory is zero is 0.48, which is almost exactly the 0.50 that one would expect. Although these data are too coarse to really allow us to tell what is going on, it does provide some reason for optimism about the effects of increased citizen awareness, increased opposition capacity building, and more benevolent international assistance in improving electoral outcomes in Africa. This entry was posted in Uncategorized on April 16, 2011 by Cyrus.